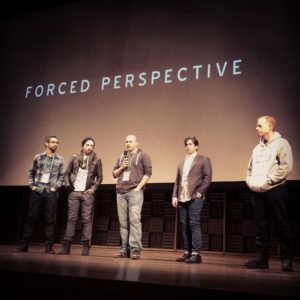 A few weeks ago, Forced Perspective premiered at the Cleveland Internation Film Festival and we couldn’t be happier with the turn out and results. On Friday night, FP managed to pack the Gartner Auditorium at the Cleveland Musuem of Art which seats 683. It then went on to screen Saturday night at Tower City Cinema to two sold out theaters. If that wasn’t enough, on closing night Forced Perspective took home the main prize in the Local Heroes Competition. 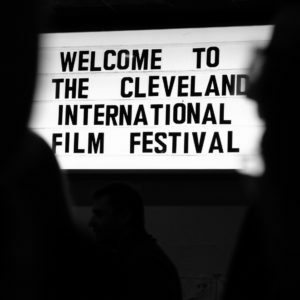 The LH competition highlights films made about Ohio, in Ohio, or by Ohioans and is based on audience vote. We were honored that film subject, Derek Hess, allowed us to tell his story and were totally blown away by the reception his fellow Clevelanders gave us. A big thanks is in order to the CIFF organizers, promoters, sponsors and viewers who help spread the word about the film, and attended the screenings. The overwhelming support made all of us who worked on the film feel right at home. Here’s a couple photos of us enjoying the fest. 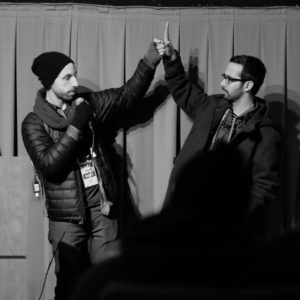 John Pope & I were pretty stoked to share cinematography credit on the film, we call this the fist five.